Courtesy of Emmer & Co.
Here’s how to order and cook a super-flavorful Emmer & Co. bird. San Francisco startup Emmer & Co. built its name by supplying heritage chickens to high-end restaurants like The French Laundry, Benu and The Slanted Door. What’s also great, Stone adds, is that you can now cook these chickens, raised on a ranch in Red Bluff, California, at home. Stone recently started selling them at his Gwen butcher shop in Hollywood, and they’re also available for home delivery nationwide directly from Emmer & Co., as well as via AmazonFresh. 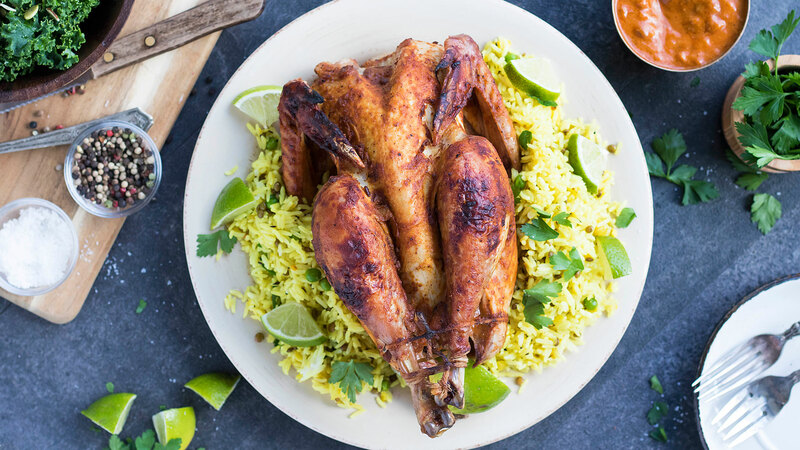 At about $9 a pound, you’re paying much more than what you would for factory-farmed chicken or even options in the organic section of your specialty grocery store. But if you talk to a chef who’s cooked these birds, you’ll quickly understand that you’re buying a completely different kind of chicken. Abgaryan is thinking about serving a breast with stuffed with black truffles, butter and breadcrumbs. He might put dark meat inside a pastilla with some dried cherries and a black powdered sugar with truffles. But we’re here to tell you that simply roasting the chicken with shiitake mushrooms, assorted greens, lemon and pancetta when you’re in a hurry works, too. This is the kind of chicken that benefits from a brine, no doubt, but it’s also a flavorful bird that doesn’t require a recipe. It takes about 112 days (roughly three times as long as conventional chickens) to raise one of these heritage birds, which are thinner and tougher but offer more highly-concentrated flavor. “The best way for me to cook this chicken is to cook it really slow, like a coq au vin, to really maximize the flavor,” Stone says. Stone also suggests brining it and then roasting it, using high heat to make the thick skin really crispy. Stone realizes these chickens are expensive, perhaps the kind of birds that some customers might reserve for celebrations. But this is the exactly the kind of food he wants his butcher shop to sell.